4 colourful round stickers that say "HAPPY", "CAKE", "FUN" & "THANK YOU", red and white paper string and manilla tag. sweets; parma violets, mini lovehearts & chupa chup lollypop. And a compostable cellophane bag for the birthday cake. We like to think that there is something a little nostalgic in the contents of this bag, and that you guest's parents will not immediately want to bin the entire thing. The party bubbles are in a tough little plastic container that can be re-filled and used again and again. Believe me, we have tested them and I have two that have survived for over a year in the garden! The cute little donut and ice-cream sundae lip gloss are charming. Balloons can amuse a child for hours, I can think of no cheaper toy for a 2 - 6 year old than a pack of balloons. 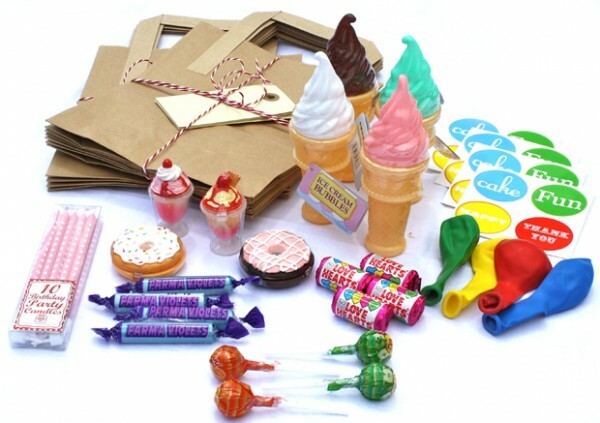 We provide you with bag, stickers, tag and string, you decide how you use them on your party bags. If you fold the string in half, cut it, fold in half again and snip, you've the perfect amount of string to thread through your 4 manilla tags and attach to your bags. 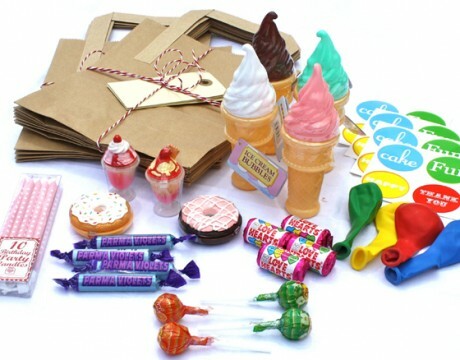 We've also included a compostable cellophane bag to put the birthday cake in. You could use the CAKE sticker to seal these if you liked. PLEASE NOTE: Several of the items in this party bag have a EU Toy Safety regulation of 36months therefore they are deemed inappropriate for children under three years of age.